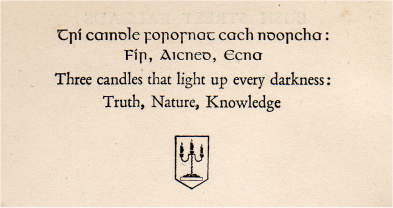 The printing press called the "Sign of Three Candles" has an interesting place in Irish political, musical and literary history. Its founder Colm Ó Lochlainn, evidently a polymath, was not content with merely founding a press: he designed a font called Colmcillle, the first fully suited to setting both English and Gaelic texts, and was director of the Irish language choir An Claisceadal. Lochlainn famously intercepted Séamus Ennis in his intention to join the British Army by employing him at the Three Candles press. With Lochlainn's encouragement, Ennis went on to become an eminent uilleann piper. Lochlainn himself was a piper, although Brendán Breathnach describes his efforts as 'desultory'. Following the difficulties of the Three Candles with the outbreak of World War 2, Ennis was hired at the age of 23 by Irish Folklore Commission at a salary of three pounds a week and sent to Connemara to collect songs. Nice work if you can get it! Back in the late sixties at the onset of the folk song revival I bought a copy of Colm Ó Lochlainn's 'Irish Street Ballads' (ISB). 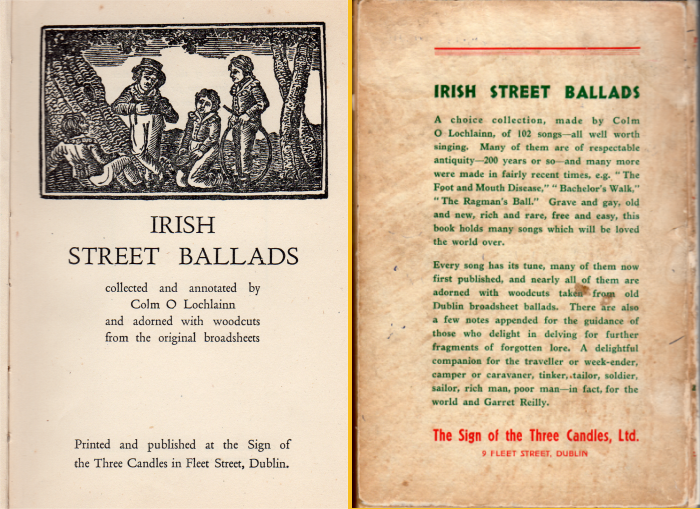 This famous volume of Irish Street Ballads was edited by Lochlainn, and presents a fascinating snapshot of the music being heard around Dublin in that period. Foolishly, I loaned it and it was never returned. Recently I was able to get a replacement copy, but I'm afraid it cost me a good deal more than the five shillings I paid for the original. I first heard many of these songs from my mother - especially the political. Her 'Bold Robert Emmet' carried such passionate anger that as a child I believed that Emmet had only recently been executed. I hope there are no copyright difficulties, but if anyone knows otherwise please let me know. I used ABCMus for editing and playback and abcm2ps for typesetting. Lochlainn's notation is for voice, i.e. he does not beam notes together unless there is melisma. I have used beaming for better readability. That aside, I have been as faithful as I can to Lochlainn's original text, even reproducing what I believe to be errors. In the one or two instances where I have had to alter the original to allow correct playback I have added a comment describing the original. If you notice any errors of any kind, please let me know.